The only thing better than a fun trivia contest is one that that will help some amazing Rockland children who are facing some serious medical challenges. Please join us for an afternoon of Penguin Plunge trivia hosted by the famed trivia administrator, Tommy Clifford. 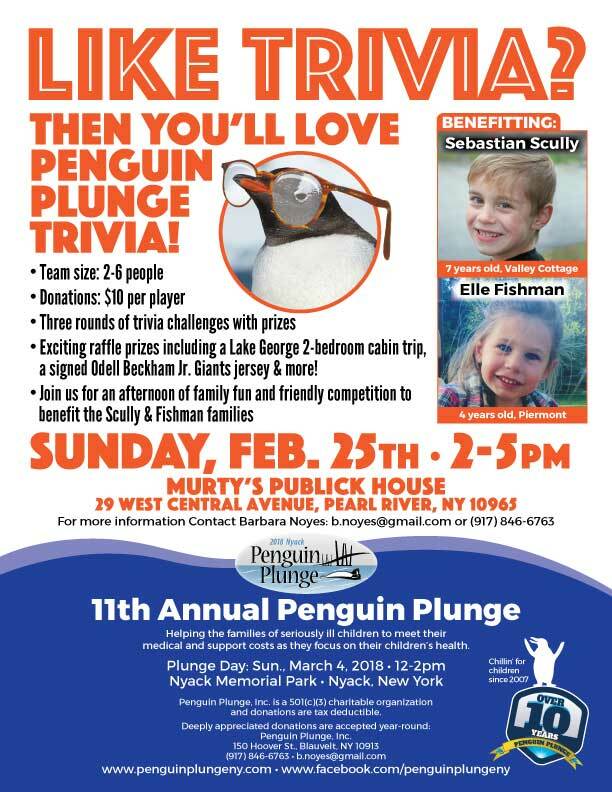 This event will be on Sunday, February 25 from 2-5pm at Murty's Publick House, 29 W. Central Ave., Pearl River and will be a $10 donation to directly benefit our 2018 Penguin Plunge children, Elle Fishman and Sebastian Scully. There will be three rounds of trivia and each winning team of up to 6 players will possibly win millions of dollars. That's right!!! Each team that wins will receive a prize of scratch off lotto tickets and the satisfaction of being both smart and generous! Light fare will be available, cash bar and fabulous raffles. In honor of our upcoming event, we've included some fun trivia facts about polar plunging! A Polar Bear “Swim” or “Plunge” is a tradition that goes back more than 100 years. It originated with the Scandinavian sauna tradition as a way to rapidly cool off after the heat of a sauna. In China and Russia, ice-swimming is reputed to have health benefits and is performed whenever the need arises, not just on New Year’s Day. Russian ice-swimmers are referred to as ‘walruses’ instead of the North American ‘polar bears’. In North America, the oldest annual plunge belongs to Boston, MA (1904). Dorchester Bay water was 3 degrees Celsius (37 F) on January 1, 2012 – barely above freezing. Regardless, over 600 swimmers came out to take the waters. The biggest event in Canada takes place in Vancouver, B.C. Vancouverites plunge into a frigid English Bay, part of the Pacific Ocean. The swim was initiated in 1921 by a local restaurateur who invited friends to join him for a quick dip and rewarded them with a free lunch. Nowadays, there are more than 2,000 participants and 10,000 spectators. Most people dash in and dash right back out. A few brave souls actually swim for a couple of minutes. One participant commented that “it’s quite pleasant once you lose feeling in your limbs”. Please come join us on Feb. 25 and have some fun!